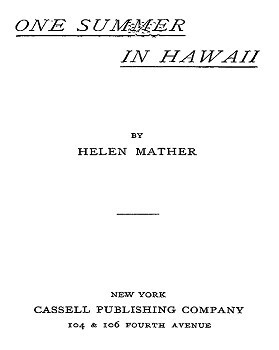 Helen Mather : Surf Riding in Hawai'i, 1891. Cassell Publishing Company, New York,1891. Waikiki is noted as a bathing resort, and it is indeed an ideal bathing place. against the outer reef, while within, the calm, pure water glides gently over a sandy floor, where the bathers disport themselves. Here, of old, it is said, the natives were wont to indulge in their aquatic sports. wind, shouting, and clapping their hands with glee. Those who succeeded received their meed of praise and applause, and those who failed were greeted with jeers and laughter. This competition must have created the race of lithe and graceful Tritons which Captain Cook found. These sports are still in vogue, I am , although I have not seen them. Geoff Cater (2012) : Helen Mather : Surf riding in Hawai'i, 1891.